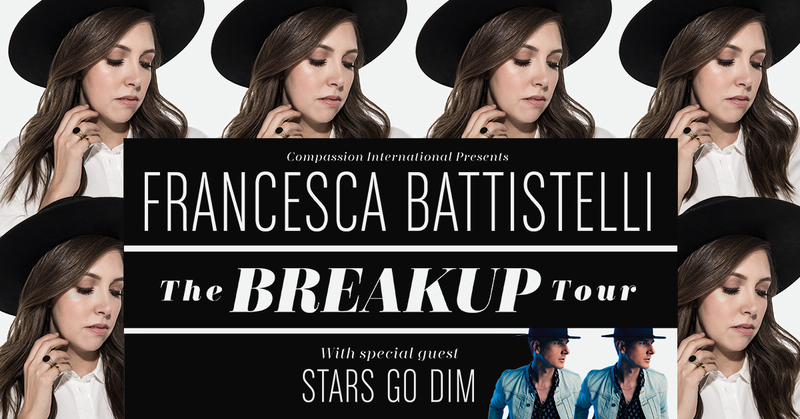 The Breakup Tour takes its name from Francesca’s brand new single, “The Breakup Song,” a powerful song that kicks fear to the curb. Co-written with MercyMe’s Bart Millard and writer/producer David Garcia (Bebe Rexha, Florida Georgia Line, TobyMac), Francesca says of her new single, “Fear is a universal struggle. We all deal with it in different ways, but it holds us back from truly living. I came to the point where I decided I wanted it out of my life for good. This song is my anthem, and I pray it encourages others to break up with fear too.” She is joined by Stars Go Dim.